"Doctors had said it would be nearly impossible to conceive naturally," Amanda Diesen explains on Brides.com, "but here we are, 14 weeks pregnant." 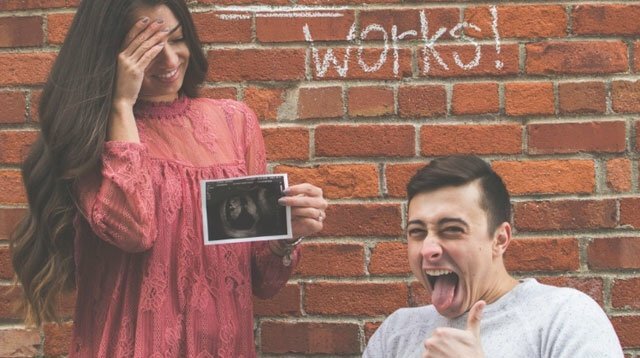 She and her fiancé Todd Krieg decided to announce the miraculous pregnancy with the above photo (taken by Kayla Duffin) on Wednesday, and it has since gone viral. Krieg was a professional motorcyclist before he was in an accident that rendered him paraplegic in 2014. He and Diesen met at the California rehab center he was sent to after the crash—she was a therapist assigned to help him with his recovery and was initially "so afraid to be unprofessional and hit on a client," despite finding him "so handsome." However, one night, he told her he had a crush on her, and she eventually moved to Amherst, Ohio, to be with him after he was discharged. It was all happily ever after until doctors told the pair natural conception would always be very difficult because of his paralysis, which ultimately inspired the caption ("It still works!") on the couple's baby announcement picture. The photo had garnered close to 3,000 comments on Reddit at the time of this post, and had inspired many other people with fertility struggles because of paralysis to share their stories. And, as it turns out, Krieg proposed to Diesen during the pregnancy shoot as well. You can see more photos from said shoot here.